In a previous blog post, I looked at two asymptotic confidence intervals for the Signal-Noise ratio of the sample Markowitz portfolio, finding that they generally did not give nominal type I rates even for large sample sizes (50 years of daily data). 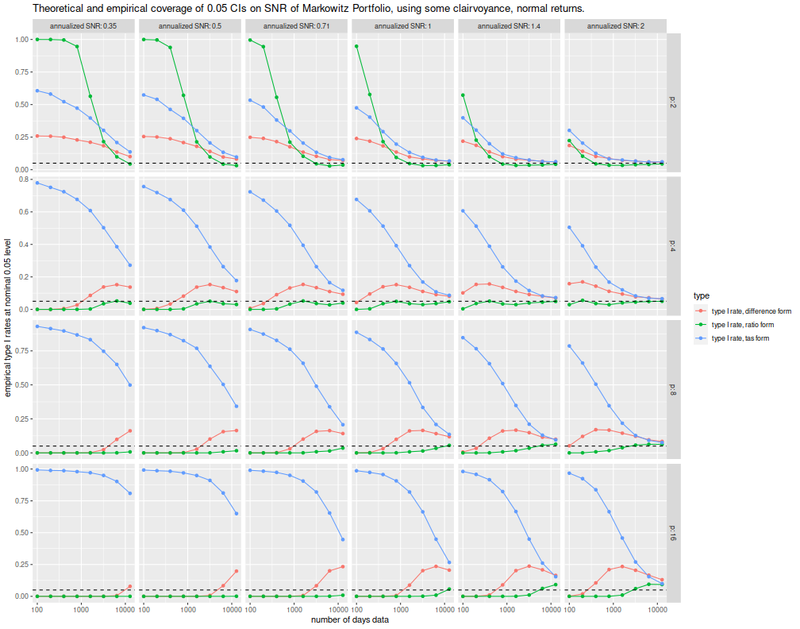 In a followup post, I looked at the covariance of some elements of the Markowitz portfolio, finding that they seemed to be nearly normal for modest sample sizes. However, in that post, I used the 'TAS' transform to a \(t\) variate, and found, again, that large sample sizes were required to pass the eyeball test in a Q-Q plot. Here we examine all three of those confidence limits, finding that none of them achieve near nominal type I rates. Again, I let \(p\) be the number of assets, \(n\) the number of days observed, \(\zeta\) is the population maximal Signal Noise ratio. Here I am observing multivariate normal returns, so the kurtosis factor is not used here. I perform a number of simulations across different values of these parameters, each time performing 10000 simulations, computing the sample Markowitz portfolio, and its Signal Noise ratio. # simulate an X: too slow. # do that many times. # actually do it many times. Here I collect the simulations together, computing the three confidence limits and then the empirical type I rates. I plot them below. The new confidence limit, plotted in blue and called the "tas form" here, is apparently very optimistic and much too high. The empirical rate of type I errors is enormous, sometimes over 90%. It should be noted that the simulations here use some amount of 'clairvoyance' on \(\zeta\); use of a sample estimate would further degrade them, but they are already unusable except for unreasonably large sample sizes. So back to the drawing board.